M&S stores across Cardiff have raised £4,660 for Macmillan Cancer Support following a Disney-themed World’s Biggest Coffee Morning as well as lots of different fundraising activities throughout September. 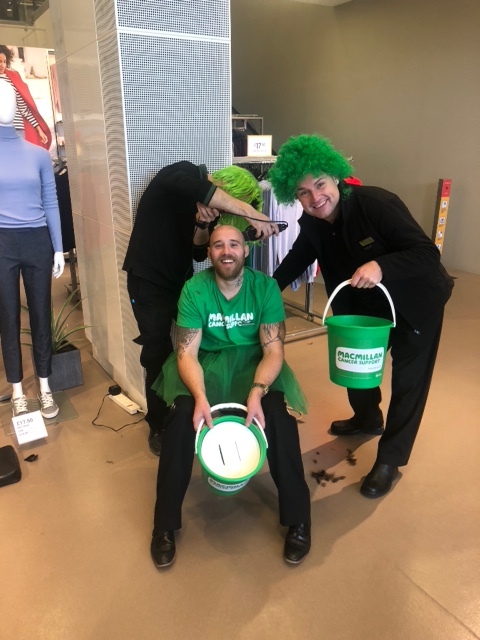 Cardiff M&S customers joined millions across the country to take part in the stores’ World’s Biggest Coffee Morning events on Friday 28th September, which saw staff dressing up in a Disney theme and braving the shave. The store was staggered by the generosity, support and involvement of the local community in the fundraising efforts for Macmillan, with plenty of coffee, tea and cake eaten along the way. With donations still coming in, the final fundraising total has yet to be announced. As well as the coffee morning event, the Cardiff M&S local stores have been helping to raise funds for Macmillan throughout September by donating 10 percent of each sale from a variety of tasty treats from M&S Foodhalls, such as the limited edition Macmillan ‘Colin the Caterpillar’, which is available throughout September. M&S Cafés have also donated 5p from every hot drink and slice of cake sold to the charity. 2018 marks the ninth year that M&S has supported Macmillan as the headline partner of World’s Biggest Coffee Morning. In this time M&S customers and colleagues have helped to raise over £13 million for the charity, including £3.5 million in the last year alone, which is enough to fund 65 Macmillan professionals for a year. The generosity of local customers and determination of colleagues to help make this the most successful World’s Biggest Coffee Morning, will help to fund Macmillan professionals who play such a vital role within our community.